The entryway arch to the old Albee Theater was incorporated into the design of the Cincinnati Convention Center and today can be seen on the side of the building at Fifth and Plum streets. 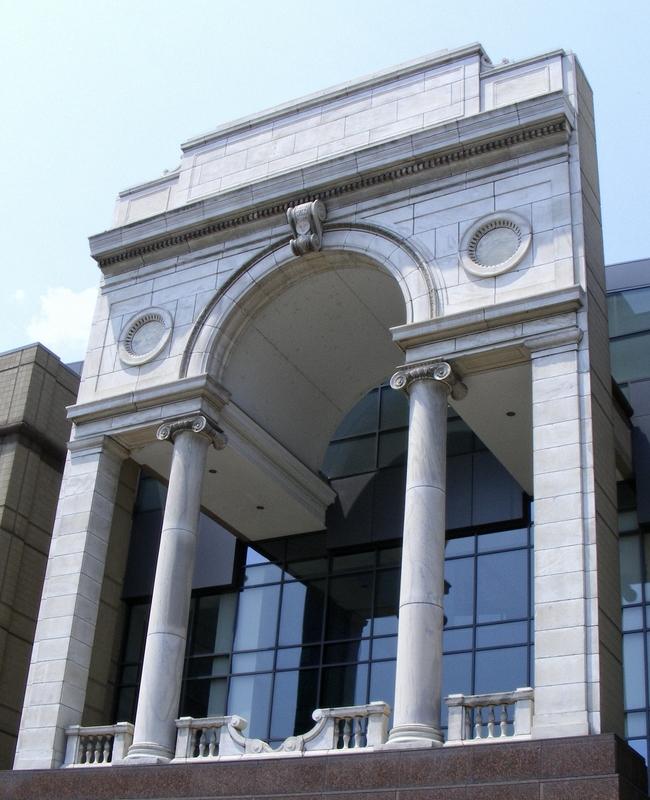 The neoclassical arch on the Fifth Street side of the Albert B. Sabin Convention Center looks slightly out of place considering the building’s modern construction. The younger generation may find it interesting, but Cincinnatians who knew downtown in the pre-1977 days recognize it instantly as the entryway to the Albee Theater that presided over Fountain Square before it was razed to make room for the Westin Hotel. The theater was one-of-a-kind even when Cincinnati had at least five grand movie theaters – crystal chandeliers, box seats and tuxedoed ushers were all part of the fun. A 40- by 70-foot Czechoslovakian Maffersdorf carpet, which was called the world’s largest rug, covered the floor. The Albee opened on Christmas Eve 1927, and was designed by Thomas Lamb, one of the most respected theater architects, whose work includes the Hippodrome Theater, the rebuilt Madison Square Garden and theaters in Egypt, India and South Australia. The theater was named after its builder, E.F. Albee, a prominent vaudeville theater owner and adopted grandfather of the notable poet Edward Albee. It cost $4 million to build and sat 3,500 people. Its first show was “Get Your Man,” starring Clara Bow. At one time, the Albee booked live stage acts as well as movies. That was during a time when people dressed for dinner. “It was a fun job,” he says. “I think I liked exploring better than anything.” Once the ushers had seated everyone, they were on their own until the movie was over. “Sometimes we would stand around and talk and other times we would explore the theater. We went from the roof to the basement,” he says. It had basements and connections to a bar called Wiggins next door. “Once we came upon the stairs which would have put us where the bartender made the drinks. Of course we didn’t venture up the steps, as we probably shouldn’t have been there,” he says. Phil and his friends discovered a connection to Vine Street and the Gibson Hotel, whose rooms were once used for vaudeville actors. “I remember being sent up to the Palace (on Sixth near Vine) when they were shorthanded,” he says. 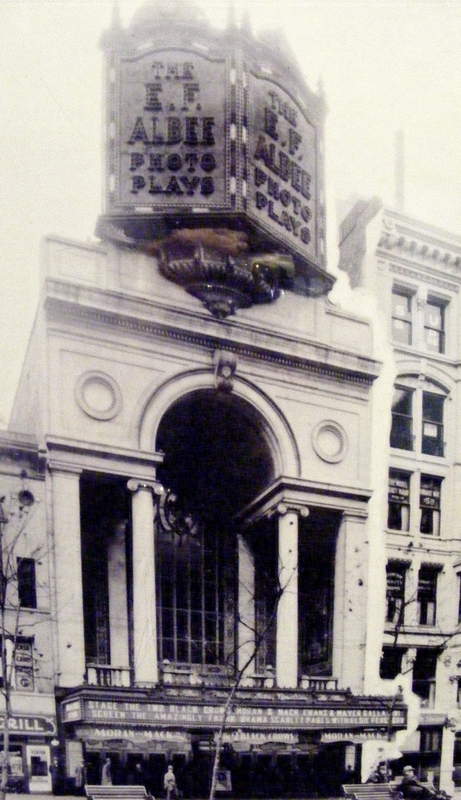 Like many of Cincinnati’s most special relics, the Albee Theater eventually became the victim of modernization, and newly constructed buildings were favored over historic ones. In 1968, the Albee’s mighty Wurlitzer organ was donated to the Emery Theater, which was also designed by Lamb, on Walnut Street. In 1978 the Albee was demolished to make room for the Westin Hotel. In addition to the arch that is now a part of the convention center, some of the doors are currently part of the Ohio Theater in Columbus. Pat and Joe Perrin, of Perrin Interiors of Springdale, salvaged many of the Albee’s Beaux Arts fixtures and used them in Music Hall’s renovated South Wing Ballroom. Walnut, brass and cast-iron filigree fixtures from the Albee gave the huge ballroom a much-needed old-world theme, including the ticket booth, etched mirrors and stair railings. The Albee was one of several theaters downtown, including the Times, the Place, the Grand, the Capital, the Palace and later, the Skywalk Cinemas.